You gotta hand it to Nvidia: While most manufacturers are responding to the PC market’s slowdown by curling into a fetal position and mewling about a savior that always seems to be right around the corner, Nvidia is actively seizing the future by unleashing a torrent of products that shake things up and are actually fun, too. And if any device sums up Nvidia’s forward-thinking philosophy to a T, it’s the Shield. Team Green’s gaming handheld is basically a nexus for all things Nvidia, packing a Tegra 4 processor that will no doubt be able to play even the most demanding Android games with aplomb. What, that’s not good enough for you? The Shield can also connect to a remote GeForce GRID server or to a computer running a modern GeForce GTX 600-series or 700-series graphics card to deliver a full-fidelity stream of your favorite PC game straight to the handheld. Yup, with the Shield, you’ll be able to play in a full 64-player Battlefield match from the comfort of your couch…or your bathtub. Glorious! 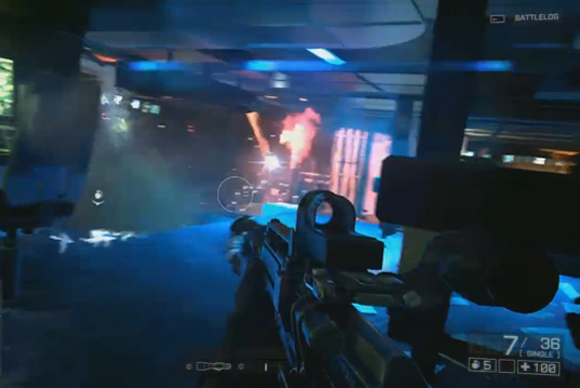 Nvidia's Shield promises to bring Battlefield 4 to your bathroom. Sounds wonderful, right? But then there’s the price. Oh, geez, the price: Even after a prelaunch discount, Nvidia plans to sell the Shield for $300 when it goes on sale next week. Sure, the Shield packs a ton of versatility, but whew—that's a lot of cash. Is it money well spent? PCWorld senior writer Brad Chacos and contributing writer Jared Newman, who both spent time playing with the Shield at various trade shows over the past few months, make the case for and against Nvidia’s nifty new handheld. Playing Skyrim on the couch sounds AWESOME. Allow me to get personal for a moment: I have a wife. She does not play video games, and so her tolerance for my hogging the television to play video games is finite. But because we love each other very much (seriously! ), she would also prefer that I not spend the duration of a given evening hiding in my office, playing PC games by my lonesome. The Nvidia Shield presents a solution: We get to keep each other company in the living room, and I get to play games like Borderlands 2 and Skyrim from the comfort of my couch. Everybody wins. The ability to play Android games is more than just icing. I’ve been testing a Moga Pro controller lately, and I’ve already spent many evenings enjoying classic-game emulators and playing controller-supported Android games on my HTC One. The whole concept of Android-based gaming has its detractors, but I’m not one of them. For quick, snack-size gaming, Android is wonderful, and being able to dig into a full PC game is the total package. OnLive is okay and all, but Jared thinks the Shield holds more promise. But is it worth $300? Well, let’s compare the Shield with other options that would address my situation. I could use a service like OnLive to stream PC games to my iPad or Nexus 7, but OnLive’s service has always been too laggy for me, so that’s out of the question. I could buy a Wii U for the same price as the Shield, but Nintendo’s third-party game support is sorely lacking, and I wouldn’t be able to use the GamePad at all while traveling, so it’s not a complete solution either. The most viable alternative would be to combine a PlayStation Vita and a PlayStation 4 once the latter is available, using the Remote Play feature that Sony has promised. However, even if I ignore the cost of the PS4 (I may buy one anyway), the Vita is only $50 cheaper than the Shield, and for serious gaming, its miniature analog thumbsticks and buttons aren’t nearly as satisfying as the Shield’s full-size controls. Besides, I already have a large library of PC games. For the PS4, I’d have to build up a library from scratch—a major added cost. Nvidia’s Shield is the cheapest option overall, and I won’t have to wait until the winter to get it. Granted, what I’m after is a luxury. But as someone with a deep love of video games and not enough opportunities to enjoy them, it’s a luxury that’s worth the investment. Surely, I’m not the only person in this situation. I have my reservations about Nvidia’s ability to ramp up PC game support and smoothly stream games over a local network, but the Shield will be a winner in my book if it can live up to its promises. I get what you’re saying, Jared. There’s no denying the awesomeness at the core of the Nvidia Shield. Heck, in a vacuum, I’d pick one up in a second. But we don’t live in a vacuum. We live in the real world, and here in the real world, the Shield costs $300. That’s a ton of cash for what’s basically a high-end device for playing Android games, which is all the Shield really does by itself. (Can’t your phone do the same thing?) At $300, the Shield already costs just $100 less than the next-gen PlayStation 4. We’re talking console money! Don’t forget, you’re probably going to need to lay down even more cash to enable that oh-so-nifty PC-game-streaming feature that holds so much allure. Very, very few Nvidia GPUs actually play nice with the Shield: You need to have a desktop GeForce GTX 650 or better to take advantage of its PC-streaming feature. Have an AMD card? Sorry, no Shield streaming for you. How about an Nvidia card manufactured before 2012? Too bad, so sad. Even the beastly Radeon 7990 won't play nice with the Shield. And that represents a vast swath of gamers. No GTX 600-series or 700-series cards are among the top ten most-used GPUs, according to the Steam hardware survey, and currently only two GTX 600-series GPUs sit in the top 20. So you’re going to need a new graphics card. Sure, technically you could get a GTX 650, but most gamers wouldn’t bother with anything below a GeForce GTX 660. That’s at least another $200. We’re up to a minimum of $500 total, before buying a single game. But let’s pretend that isn’t an issue, or that you already own a newer GeForce GPU. How does the PC-game streaming hold up? Pretty well, actually. I spent a lot of time playing the production units Nvidia had at E3. 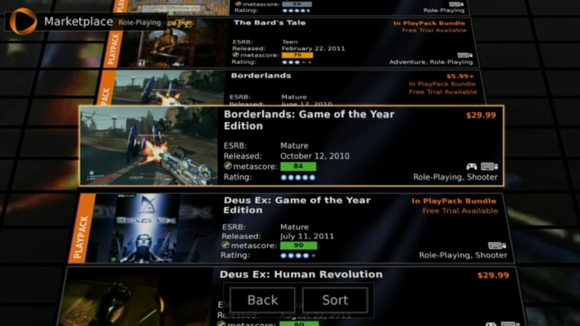 Streaming games played just fine: Latency was low, and everything seemed smooth and responsive. The controls worked incredibly well for shooters like Metro: Last Light and Borderlands 2, though the simplified gamepad would probably be annoying if you tried to play one of the deep, keyboard-centric and mouse-oriented games that are the PC’s stock in trade. 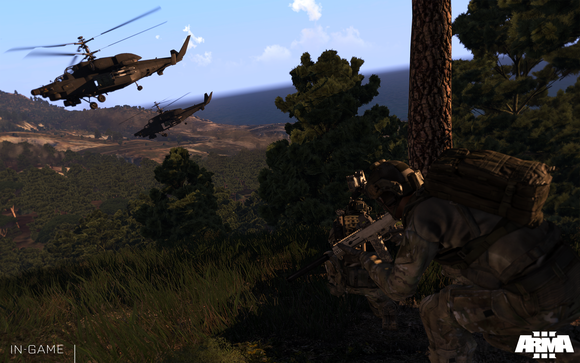 A PC game with complex controls, such as the upcoming ARMA III, probably wouldn't translate so well to the Shield's small screen. But there’s a catch: The Shield supports only a limited number of games, and you can stream from your PC to your Shield only over your local Wi-Fi network. You can play Crysis on your couch, but you still can’t play it at the park. As I said before, I truly love the Nvidia Shield as a concept. The hardware is rock-solid and utterly comfortable, the Miracast functionality opens up a whole world of media-streaming possibilities, and the mere idea of playing Skyrim on a handheld in my backyard is almost—almost—enough to make me start quivering with excitement. Even the speakers rock compared with those of the typical Android device. The Shield is an amazing piece of hardware. But is it $300-plus worth of amazing? Nvidia hasn’t sold me on that. I heartily dig it, but there’s no way I’m ever going to buy one—especially since I’d need to buy a pricey new graphics card to unlock its true potential.